Teachers and professors who want to set up exoskeleton courses or labs. The EduExo will come with additional teaching material and can save a lot of time and money preparing a course. An educational robotics kit that will help you to learn about exoskeleton technology. A do-it-yourself kit that requires your active participation and willingness to learn and try new things. A medical device that is intended to be used for any kind of therapy or medical application. An exoskeleton that makes you super strong. The actuation is weak. It is only intended to illustrate basic exoskeleton principles. You will not be able to do more chin-ups and it cannot support your arm in a significant way. It rather provides a gentle guidance of your movements. A plug-and-play device that works out of the box. You have to make it work, that is a feature! More details on the hardware and content of the tutorial can be found below. If you have any questions or suggestions, please write us. 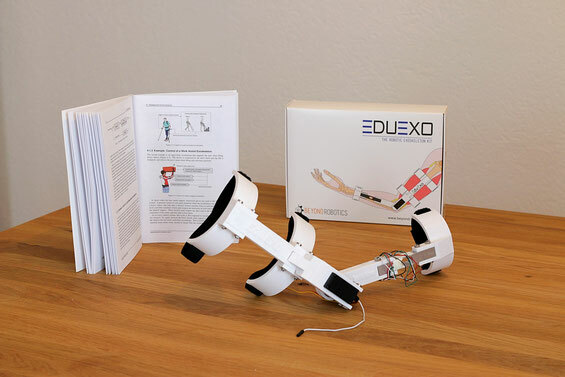 The EduExo is a one degree-of-freedom elbow exoskeleton. 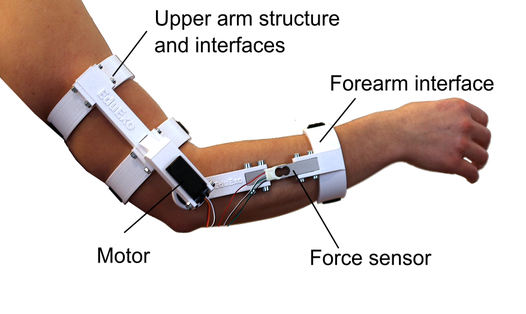 The hardware combines off-the-shelf components (motor, force sensor and Arduino microcontroller) with a rigid exoskeleton structure and cuff interfaces. 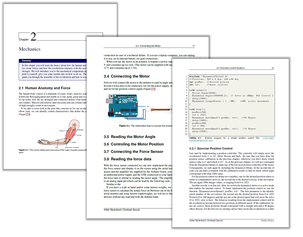 The handbook is used together with the exoskeleton hardware to teach you everything you need to understand robotic exoskeletons. Topics covered are human-centered mechanical design, electronics, software and control systems. Additionally, basic human anatomy is covered to help you understand how human and exoskeleton interact. Finally, you will be introduced to how to use the exoskeleton as a haptic input device for a virtual reality or computer game. The first chapter introduces the field of robotic exoskeletons. A look at exoskeleton history, examples of existing systems, their basic technology and their applications will get you started. The next chapter discusses mechanical and biomechanical aspects of exoskeleton design. It covers the basics of human functional anatomy and exoskeleton mechanics: How does the human create forces and is able to move? 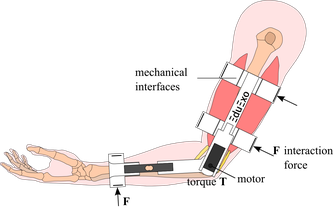 How does the exoskeleton provide support? How is the exoskeleton designed to match the form of the human and how is it attached? During this tutorial, you assemble and fit the exoskeleton to your arm. The next chapter covers the electronic and software components that convert the mechanical exoskeleton into a robotic exoskeleton. You will connect the electronic components, sensors and actuators to the microcontroller, and write the basic software routines to read sensor signals and control the motor. Next, control systems, which define the behavior of the exoskeleton, are discussed. Different controllers that define the exoskeleton-user interaction are introduced. Step-by-step we discuss, implement and test them. Virtual realities and video games are well-established methods in use with exoskeletons. They are used to increase motivation in patients that use exoskeletons for rehabilitation, e.g. after a stroke. You will learn how to create a computer game or a virtual reality, how to connect the exoskeleton to your computer and how it becomes your haptic interface to the virtual world. We will implement control strategies that make the exoskeleton assist you- making the game easier. 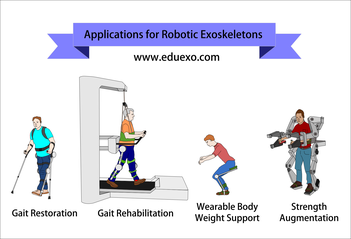 The EduExo tutorial introduces you to all that you need to know for a deeper understanding of robotic exoskeletons. But, of course, there are many more possibilities of what you can do, and the EduExo can be a platform for your own experiments. Maybe you want to develop your own control algorithm or a new computer game that can be controlled with the EduExo? Or you want to learn more about mechanical design; you can start by designing new parts and interfaces to optimize the exoskeleton for your own arm anatomy. We offer and develop several extensions to the EduExo that will enable you to discover additional and specialized aspects of exoskeleton design, control and applications. 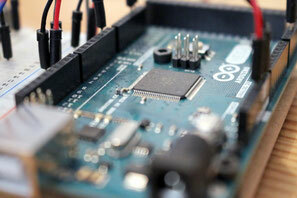 Each extension will include a handbook and either a hardware or software component. Similar to the EduExo handbook, the courseware will provide theoretical background knowledge and a tutorial with practical exercises.